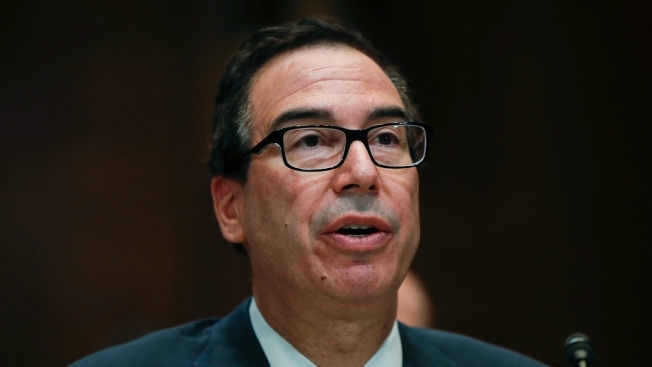 In this file photo, Treasury Secretary Steve Mnuchin testifies before the Senate Appropriations Financial Services and Government Subcommittee hearing on Capitol Hill in Washington, Tuesday, May 22, 2018. The U.S. federal budget deficit rose in fiscal year 2018 to the highest level in six years as spending climbed, the Trump administration said Monday. The deficit jumped to $779 billion, $113 billion or 17 percent higher than the previous fiscal period, according to a statement from Treasury Secretary Steven Mnuchin and Office of Management and Budget Director Mick Mulvaney. It was larger than any year since 2012, when it topped $1 trillion. The budget shortfall rose to 3.9 percent of U.S. gross domestic product. The deficit increased by $70 billion less than anticipated in a report published in July, according to the two officials. Federal revenues rose only slightly, by $14 billion after Republicans chopped tax rates for corporations and most individuals. Outlays climbed by $127 billion, or 3.2 percent higher. A spike in defense spending, as well as increases for Medicaid, Social Security and disaster relief, contributed to the increase. Trump: We don't have to go as fast on interest rates from CNBC. The Trump administration and congressional Republicans have pledged their commitment to fiscal discipline, despite the fact that they passed a tax law projected to dramatically expand budget deficits last year and then authorized a boost in spending. In a statement, Mulvaney claimed that "America's booming economy will create increased government revenues," a point the GOP has repeatedly argued in favor of its tax plan. "But this fiscal picture is a blunt warning to Congress of the dire consequences of irresponsible and unnecessary spending," he added. "... Going forward, President Trump and this Administration will continue to work with Congress to make the difficult choices needed to bring fiscal restraint, which, when matched with increasing revenue, will reduce our deficit." The Trump administration has proposed dramatic cuts to spending in several government agencies to reduce deficits. Even many Republicans have rejected the severity of proposed budget cuts. The Treasury noted that receipts related to "excise, customs and other" jumped to $35 billion in September 2018, a 35 percent increase over the prior-year period. It is unclear how much of that revenue relates to Trump's tariffs on imports from major trading partners.